National Park Archipelago Los Roques is a necklace of islands in the Caribbean Sea, situated 80 miles off the north coast of Venezuela. Technically referred to as an archipelago, Los Roques is an unspoiled atoll, characterised by its extremely clear waters, magnificent coral beds, diverse and varied flats, sandy beaches and hundreds of smaller mangrove cays. Los Roques was declared a National Park in the mid 1970s and then in the mid-1990s, even more environmentally conscious regulations were enacted to protect the overall environment of the entire archipelago. Thanks to its location (only 12 degrees north of the equator), Los Roques’ air and water temperatures vary little. The climate at Los Roques is dry and it rarely rains. The area is relatively unaffected by cold fronts and hurricanes. These factors make Los Roques one of the most consistent bonefishing locations in the world. The best season is from mid-January to October but since the Caribbean Sea is a tropical sea with tropical weather conditions, there is also good fishing during the other months of the year. Los Roques offers outstanding numbers of bonefish with a very solid average size of 3 to 4lbs. Fish over 5lbs are caught more frequently than fish less than 2lbs, and good numbers of fish in the 7 to 10lbs range are present. 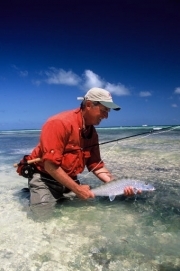 In recent seasons, the largest bonefish released weighed in at a whopping 13lbs. Although bonefish are the main attraction in Los Roques, tarpon from 10 to 100lbs are frequently landed. They can often be seen rolling in the channels and occasionally on the deeper flats. Permit are seen occasionally, but are rarely caught. Other available species at Los Roques include barracuda, snook, cero mackerel, bonito and a variety of snappers and hard-fighting jacks. The most important thing separating Los Roques from most other locations is that, during a day of fishing, anglers will find many different varieties of flats and fishing areas allowing them to be on productive water during any given time of the day, no matter what the tides are doing. Some flats are coral, some are soft marl covered with turtle grass and sea weed, however, most flats are firm, clean white, or golden in colour, and easy to navigate. The fishing at Los Roques is mostly conducted on foot. A recent addition is a 36-foot contender blue water boat powered by twin yamaha 350 four-stroke engines. The boat is set up for fishing with conventional tackle as well as for fly fishing. Species that can be caught include white and blue marlin, sailfish, dorado and yellow-fin tuna. The offshore fishing is excellent in the area and can be a great day out as part of a flats fishing week. Guests stay at the Posada Acuarela, a small 11-room hotel, on the island of Los Roques. Each bedroom is air-conditioned and has its own private bathroom. The Posada is simple, but more than comfortable for a group of fishermen. The owner of the hotel happens to be a chef and the Posada Acuarela has arguably the best food on the island. Great value but still with great fishing and easy to get to, even for a long weekend. Land packages are from $4,430 for a 7-night stay, $3,470 for 5-night stay.